See what WinSleep is doing from a remote computer! Current Version: 1.2.9.0, released December 29, 2018. 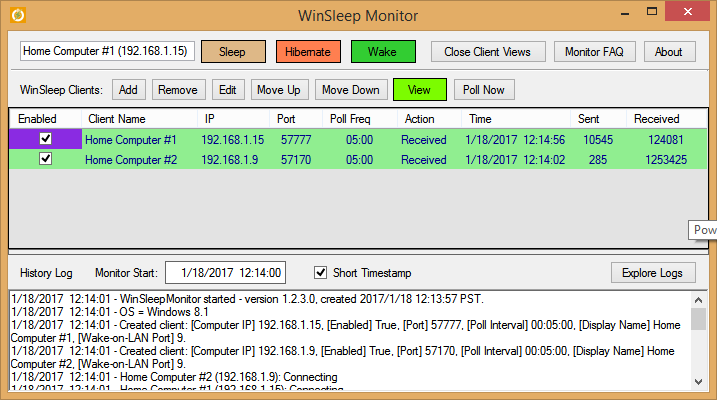 WinSleep Monitor is the remote viewer for WinSleep. 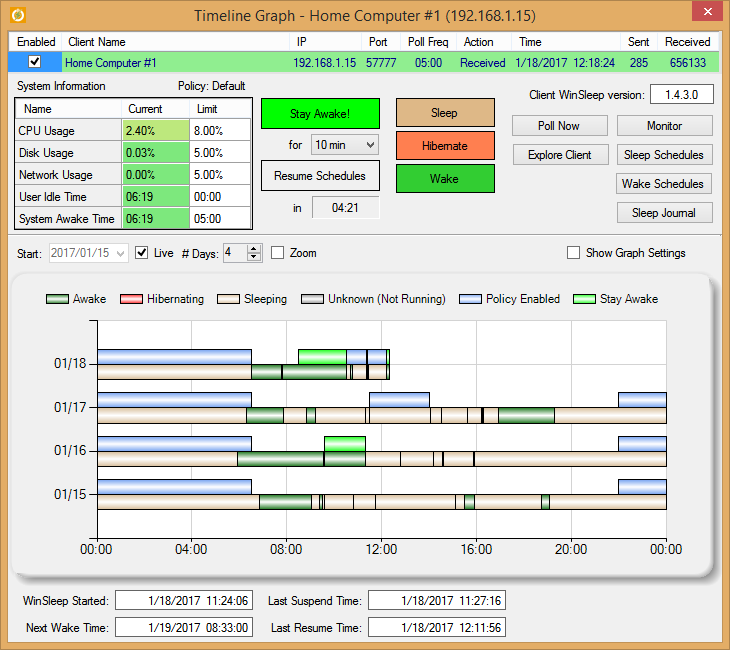 Shows WinSleep programs running on any number of remote computers, including timeline graphs and sleep journals. Sleep/Hibernate/Wake a client computer remotely. Connects to WinSleep clients by IP address or by computer name. Connection is encrypted and secure: WinSleep authorizes the attempted connection by monitor IP address, monitor computer name, or by password. 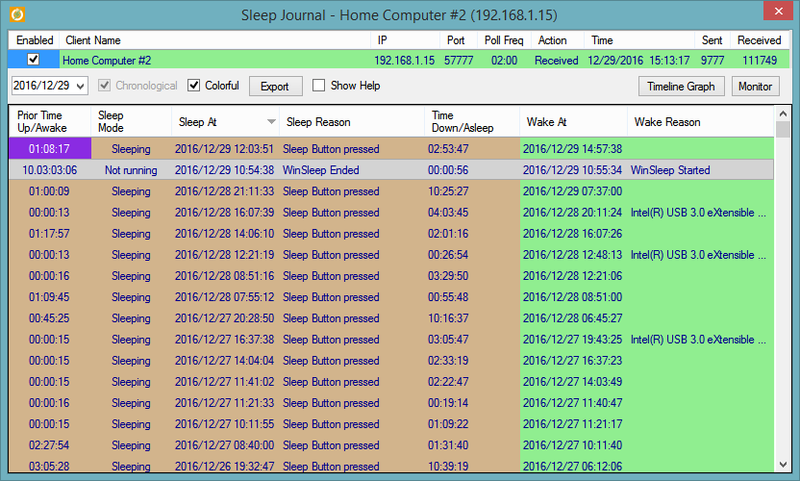 WinSleep can accept requests from any number of Monitors, and a Monitor can connect to any number of WinSleeps. WinSleep version 1.4.5.0 or greater is required to connect to WinSleep Monitor. 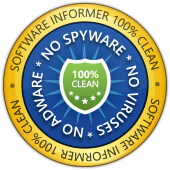 100% Virus Free! 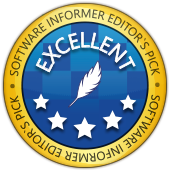 Read the Rarity Soft Review. 1.2.9.0 - More reliable read/write for configuration file. 1.2.8.0 - Show last response time of client in Timeline view. Minor stability fixes. 1.2.7.0 - Fixed timeline issue for multi-day awake periods. 1.2.6.0 - Fixed date limit issue in timeline for midnight power state changes. 1.2.5.0 - Allow remote editing of Sleep/Wake Schedules (WinSleep 1.4.5.0 or greater required). 1.2.4.0 - Stay Awake period is now attached to the Wake Schedule instead of the associated Task. 1.2.3.0 - Stay Awake and Resume Schedules remotely; show client system information grid (WinSleep version 1.4.3.0 or greater required). 1.2.2.0 - Sleep/Hibernate/Wake a client computer remotely (WinSleep version 1.4.2.0 or greater required). PrLog.org - MollieSoft Announces the Release of WinSleep Monitor 1.2.2.0. Comments or questions? Email support@molliesoft.com. WinSleep Monitor © 2016-2017 by Marvin Hymowech.